One day I wandered over to University of Hawaii Maui College campus looking to sneak into the culinary school. And by sneak, I mean it’s supposedly open to the public, but I couldn’t confirm that so I just ventured over. It turned out to be closed (boo), but I did catch the end of a swap meet happening behind the college. I found a few friendly farmers and bought some lovely farm fresh starfruit, mixed greens, Japanese cucumber and scallions, which ended up becoming a totally delicious salad. I saw a similar recipe on Food Network’s website that included ahi, so I decided to include tofu. I threw my tofu straight into the salad, but it would also be really nice lightly seared in a sesame oil. I ate this salad for breakfast on the last day of my trip and every bite was better than the next. I don’t always love fruit in salad, but starfruit is so crunchy and not overly sweet that I think it really works well here. Is there a method to salad? Toss your greens into a salad bowl. Slice the starfruit crosswise. Poke out any seeds you might see in the slices. 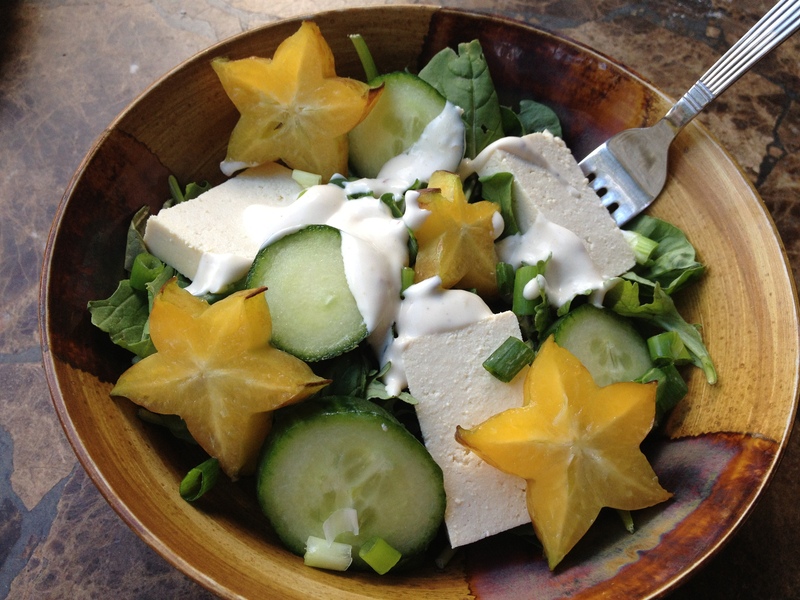 Add the starfruit, cucumber and scallions to your salad. If desired, heat a small amount of sesame oil in a small saute pan. Sear your tofu on both sides for a few minutes and let cool a minute or two before adding to the salad. You don’t want your greens to be wilty for this. ← Hawaiian Macadamia Lavender Rice. That star fruit is amazing looking. Beautiful salad.